Do you love the taste and texture of deep fried foods? Could you do without all the oil and calories from the deep frying process? One of the best ways to cut the fat out of your daily intake is to start using an air fryer to prepare your favorite fried foods. So, how does an air fryer work? An air fryer is a countertop appliance that circulates hot air around your food in order to cook it. Unlike a deep fryer, an air fryer uses little or even no oil too cook your food. Picture cooking your food with a blow dryer and you’ll get the concept. Because of using less oil, an air fryer is thought of as a new healthy way of cooking. The healthy benefits of this appliance is not only reducing risk of heart disease caused by saturated fat from cooking oil but also helping you to lower calorie consumption. Some people question if cooking with a very high temperature will cause cancer. Surprisingly, this oil less fryer is safe for health and does not increase risks of cancer. Other benefits of an air fryers include less smell and less oily mess. It is also easy to use. It can not only fry food with less oil but also bake, grill or roast. Many air fryers such as SimpleTaste Multi-function Electric Air Fryer and GoWISE USA 7-in-1 Air Fryer, GW22621 come with pre-set programs for you to select to cook your favorite dish from chips, meat, chicken, steak, shrimp and fish. This appliance can do just as a convection ovens does. Learn more about differences between air fryers and convection ovens. Air fryers come in a variety of colors, sizes, shapes, and technologies so you can find the right air fryer that looks great in your kitchen and meets all of your needs. Air fryers can also bake, grill, and roast foods, making them a very versatile appliance that’s great to have in any kitchen. Modern air fryers are a surprisingly simple design. They are usually a box or cylinder shaped appliance with a lid on the top. 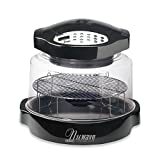 Inside the air fryer is a stainless steel wire basket with a drip pan underneath to catch oil and juices from the food. All you have to do is to place your food into the basket, apply a light coat of oil to promote a brown crispy texture, close the lid, set temperature and set a timer. Most of these less-oil fryers come with cookbooks that tell you the proper temperature and cooking time for each food you prepare. You just set your fryer to the right temperature and set a timer. The air fryer will instantly begin producing superheated air at the set temperature, and then its fan will circulate the hot air around your food. When the time is up, you will get nice, crispy, oil-less food that doesn’t have as many calories as you would get from foods fried in heavy oils. For foods high in fat like chicken, most of the fat and grease simply drips off into the drip pan. Air fryers are a surprisingly effective and easy way to cook virtually any foods. In fact, you can even bake a cake inside your new air fryer! This is a feature found in all air fryer. The technology circulates the air around the cooking chamber extremely fast, so the food is cooked evenly from all sides. Philips airfryers as in the picture above also come with a patented starfish design to aid hot air flow so the air in Philips airfryers heat quickly, build pressure, and move fast. That’s why they are the original and still one of the best selling brands of air fryer in the market today. There are several air fryers available in the market. The air fryers that come with manual temperature and time control are usually cheaper than those with digital touchscreen. For example, Philips HD9220 Airfryer is approximately $100 cheaper than Philips HD9230 Digital Airfryer although both models have the same capacity. Check out other air fryers with your preferred control system in our air fryer reviews. This is a smart feature found in the several digital air fryer including SimpleTaste Multi-function Electric Air Fryer and GoWISE USA 7-in-1 Air Fryer, GW22621. These air fryers use a modern touchscreen interface such as that of GoWise in the picture above so you can change your parameters with ease. Set your cooking temperature and timer, or select from built-in smart programs from the menu such as fish, chips, or steak. It’s all done quickly and easily with just the touch of a finger on the beautiful digital display. Despite this unique feature, the GoWise air fryer is still among the most affordable air fryers in the market. This feature is found in the Philips HD9240 XL Digital Airfryer. You can save your presets much the same as your radio stations on your car radio. When you cook your favorite foods, you can press the Smart Button to save your temperature and time settings, and label it as you want for later use. The next time you prepare the same food, simply select the correct Smart Button setting. Your air fryer knows exactly what to do. Air fryers are a great way to reduce fat and calories in your diet. They are easy to use to cook almost all of your meals as well. You will love how fast and easy it is to cook with an air fryer, plus you’ll love the flavor. If you are in the market for a new air fryer, look for one that is suitable for your needs and budget. Some of the best air fryers also give excellent performance at a lower cost. Good luck!